Fontana, CA - Seven California racers took home wins from the NHRA Lucas Oil Drag Racing Series, Pacific Division event at Auto Club Dragway at Auto Club Speedway over the weekend. Fontana, CA - The enormous response over the first 2 years has pushed the event to grow including 3 full days of racing with increased payouts during Memorial Day weekend May 25-28, 2017. Santa Anna, CA - All 2017 events will be held at the Auto Club Dragway in Fontana. The location allows the NMCA WEST to host affordable, family-friendly and racer-friendly events. 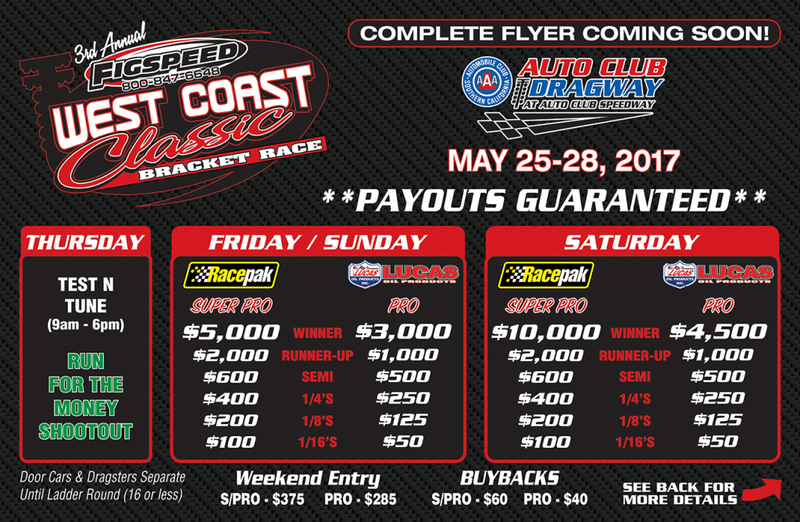 Fontana, CA - The 2nd Annual Figspeed West Coast Classic comes to Auto Club Dragway this weekend June 3-5th. Racepak Super Pro and Lucas Oil Pro racers will have their opportunity at nearly $75,000 in Guaranteed Money and over $40,000 in Racer Appreciation Prizes and Give a Ways. 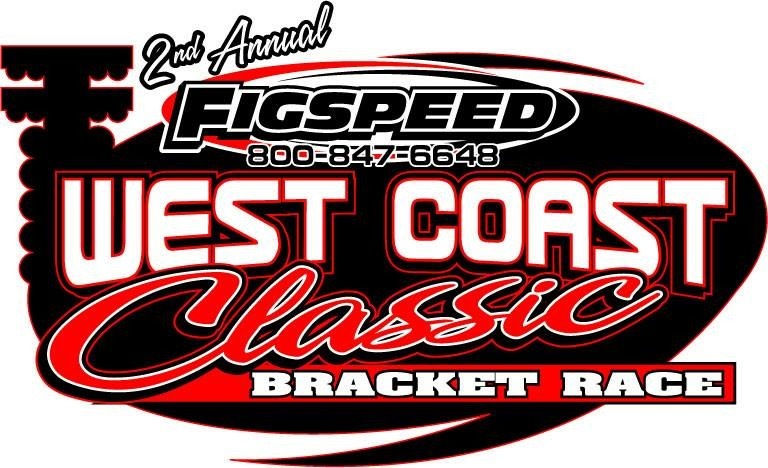 Fontana, CA - The 2nd Annual Figspeed West Coast Classic will include the Guaranteed Prize Money of $5,000 to win Racepak Super Pro and $3,000 to win Lucas Oil Pro, a Racer Appreciation Party, the Huntsville Engine 64-Car $15,000 to win and Meziere Enterprize 32-Car $5,000 to win 1/8th Mile Shoot-Outs Saturday evening “Under The Lights”, and even more round prizes and Racer give-a-ways. Pomona, CA - Todd Piper, Robert Steffen, Nick Hastings and Mark Schwalm each scored NHRA Summit Racing Series National Championships at Auto Club Raceway at Pomona. 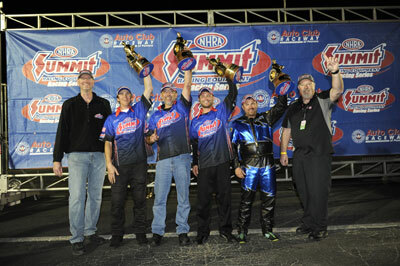 This year marks the 16th season that NHRA and Summit Racing Equipment have crowned national champions. Pomona, CA - The NHRA Summit National Championship was also up for grabs at this the final NHRA event of the year with Todd Piper leading the way, taking the Summit Super Pro National Championship. Piper was joined by Robert Steffen, Nick Hastings and Mark Schwalm celebrating wins and NHRA Summit Championships. Fontana, CA - In the final results from the NHRA Summit Racing Series Pacific Division Finals at Auto Club Dragway at Auto Club Speedway, local racer CW Hoefer along with three racers from Wild Horse Pass Motorsports Park took individual wins and are heading to the NHRA Summit National Championship next month at Auto Club Dragway at Pomona. Fontana, CA - Justin Lamb and Bernie Polvadore won for the second week in a row at Auto Club Dragway grabbing the wins for this weekend’s JEGS Pacific SPORTSnationals and the NHRA Lucas Oil Drag Racing Series.